I just came back from KOST-2015, an international congress on heterocyclic chemistry in Moscow, Russia. The conference was superbly put together by my friends, Profs. Nenajdenko and Vatsadze in memory of Prof. Kost (http://www.kost2015.ru). Of all the scientific vignettes I was exposed to, one particularly thought-provoking insight comes to mind. It deals with the inner workings of Prof. Togni’s electrophilic trifluoromethylation reagents (http://pubs.acs.org/doi/pdf/10.1021/cr500223h). In his talk, Togni described the genesis of this research program and commented on a variety of nucleophilic partners that can be trifluoromethylated with the help of his hypervalent iodine-containing molecules. I am showing one of them below without any intent to dwell on the specific reactions. Two forms exist: the parent and the protonated one, with the latter being the desired electrophilic trifluoromethylating species. In order to maintain high selectivity of CF3 transfer, one needs to avoid decomposition by way of premature cleavage of the Cphenyl-I bond. If one maintains the oxygen atom in its protonated form, this detrimental pathway is avoided. The question is: why? This is where frontier orbitals come to rescue. I am not going to show their symmetry as it would be rather tedious. In the aforementioned Chem. Rev. article, you can see all those red and blue blobs. The key is that protonation changes the area where LUMO is localized, offering a compelling rationale for why the non-protonated form is labile at the Cphenyl-I bond. I thought this is a great example of using frontier molecular orbitals to explain the reactivity preferences and I hope students take this lesson to heart. There is no way there is anything terribly complex in some of these computations. If you wonder where those hypervalent iodine species come from, they are derived from TMSCF3, whose chemistry I had a pleasure of working on in Professor Prakash’s lab a while back (http://pubs.acs.org/doi/abs/10.1021/cr9408991). It is curious that, among many different areas of use, the nucleophilic trifluoromethylating reagent (TMSCF3) has found application in efforts to generate electrophilic trifluoromethylating reagents. We had a lively discussion regarding the ene reaction at our weekly group meeting today. This was done as part of a synthesis problem set and reminded me of an under-appreciated principle that should remain important in attempts to understand aldehyde reactivity. I refer to formyl hydrogen bonds, the likes of which are on display in a recent paper by Krische and Houk in JACS (http://pubs.acs.org/doi/abs/10.1021/jacs.5b04844). The appreciation of this interaction goes back to the foundational studies by Corey and co-workers. 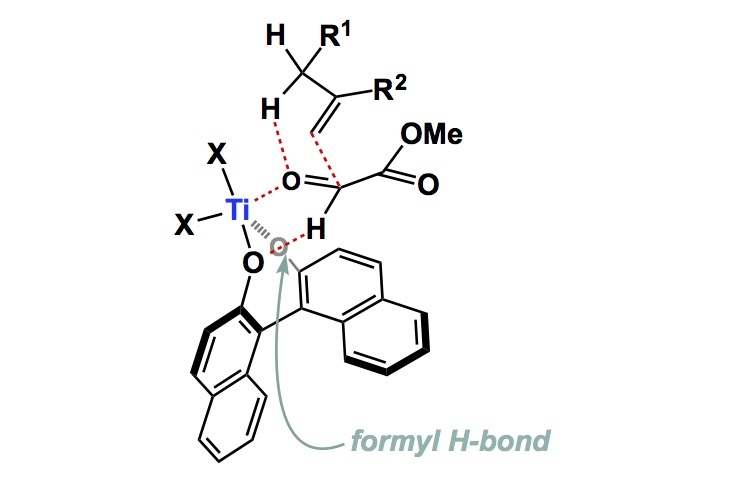 Here is a link to a great overview that covers some of the structural aspects of the formyl hydrogen bond: http://pubs.rsc.org/en/Content/ArticleLanding/2001/CC/B104800G. I have also included the accepted transition state model for the Lewis acid-catalyzed ene reaction developed by Mikami and colleagues. 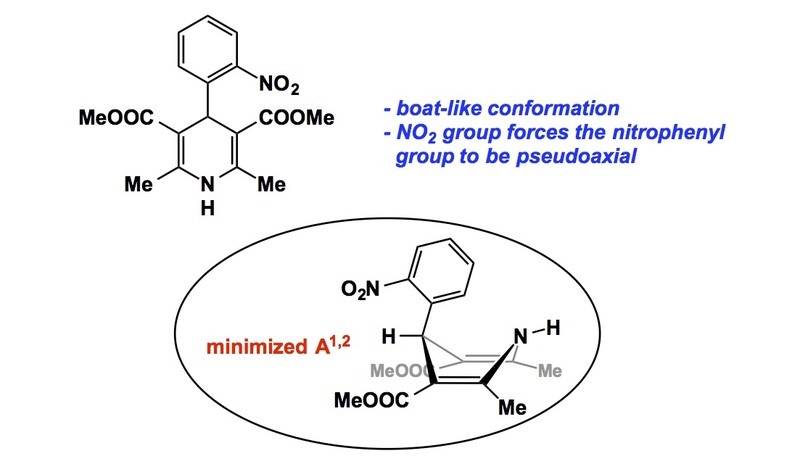 This constitutes a particularly striking example of the capacity of aldehydes to participate in hydrogen bond formation. There have been several X-ray structures that provide atomic level evidence for formyl hydrogen bonds. On various accounts, it is estimated to be worth between 6 and 9 kcal/mol, which is not insignificant. By all means, Lewis acid coordination to the aldehyde oxygen atom enhances the acidity of the aldehyde CH functionality. We had Silas Cook (Indiana University) visit our department earlier this week. This occasion presented an opportunity to learn about both his iron catalysis and total synthesis efforts. Silas’s imaginative route to artemisinin appeared in JACS several years ago and it remains a landmark of synthetic efficiency. You can see the paper in its entirety if you follow the link below, so I am just going to comment on one step – the Wacker oxidation to generate the ketone precursor. The reaction was done on a 9.4g scale. The search for the optimal condition had attracted my attention. Everything else went fairly miserable, but the hydrogen peroxide-mediated version of the Wacker process delivered the product with good yield. I appreciated hearing this story, particularly during the week when we heard about the Medicine Nobel Prize for the discoveries of artemisinin and ivermectin. As you may also know, Jay Kiessling of UC Berkeley has received a ton of attention (and tens of millions of dollars worth of funding) for his synthetic biology effort to find a production route to artemisinin, yet the jury is still out in regards to the economics of that method. Silas, on the other hand, is offering something really reasonable and inexpensive. My vote is with his synthesis. My wife is a hematologist, so we talk about blood disorders all the time. Since she has a biochemistry background, it is easy for us to communicate on a level that is somewhat molecular in nature. I lose her when we start considering clinical aspects of blood disease – this is way over my head. In regards to molecular components of blood, I was glad to hear Professor Rudi Fasan’s advances in the area of cyclopropanation while in Rochester last week. Myoglobin is what links Rudi’s work with my post-dinner discourses with Jovana. 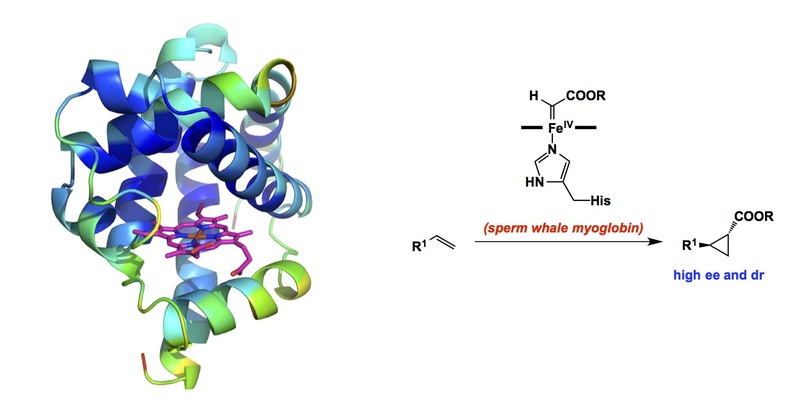 In his Angewandte paper, which was published at the beginning of this year, Rudy and his team were able to show that myoglobin catalyzes cyclopropanation of olefins. Coupled with its function as oxygen carrier in the heart and skeletal muscles, this cyclopropanation business makes myglobin ever more interesting. Scalability and surprising robustness (up to 46,800 TON) are the most remarkable features of this system. I particularly liked the rational approach to improving catalytic efficiency through site-directed mutagenesis. As you might imagine, there are just so many reactions out there that involve activation of diazo compounds using transition metals. I think that the future for atom transfer processes using the constituents of blood is a bright one.